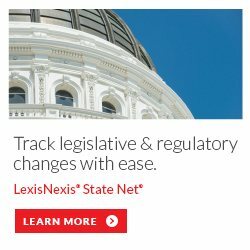 LexisNexis® State Net® helps you identify, assess, and respond quickly to legislative and regulatory activity. Use State Net resources to search, analyze, track, and report on relevant bills, regulations, and local ordinances. The WASHINGTON House approves HB 1706, which would require Evergreen State employers to pay disabled workers the same $12 per hour minimum wage they pay other workers. The measure moves to the Senate (ASSOCIATED PRESS). The OKLAHOMA Senate approves HB 2612, which among several things would allow Sooner State employers in “safety-sensitive” fields to inquire whether employees have medical marijuana licenses. It moves to Gov. Kevin Stitt (R) for consideration (TULSA WORLD). SOUTH DAKOTA Gov. Kristi Noem (R) vetoes HB 1191, a bill that would have legalized the cultivation and sale of industrial hemp in the Flickertail State (JURIST). The MARYLAND Senate approves HB 166, which would raise the Old Line State minimum wage to $15 by 2025. It faces a final vote before it could go to Gov. Larry Hogan (R), who opposes it (WASHINGTON POST, LEXISNEXIS STATE NET).